Oops I was very bad and spent all my free time on E-bay last week and no crafting at all, but I now do have some very exciting bargains snail mailing their way to me. I will try to make up for it as well by posting a few times this week. 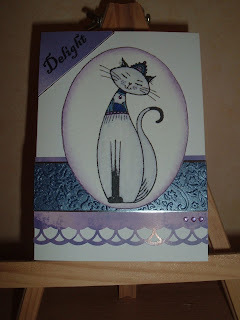 So first up here is my card for this weeks StampTV sketch challenge, this is a new little Do Craft stamp I picked up from a fair a few weeks ago, just love this cat.